The Delaware Line was a formation within the Continental Army. The term "Delaware Line" referred to the quota of one infantry regiment which was assigned to Delaware at various times by the Continental Congress. The smallest of the state lines belonged to Delaware. On 9 December 1775 the Continental Congress authorized a single regiment to serve for a year, and the state government recruited it in early 1776, with John Haslett as colonel. Some of the companies saw their first action on the shores of Delaware Bay by capturing a boat from the Royal navy frigate, the HMS Roebuck. The regiment achieved a higher level of training than many other units because its adjutant was a former British captain. It went to New York City and gained fame during the defensive battles in that campaign. The regiment reenlisted for the duration of the war in 1777, now under the command of Colonel David Hall. 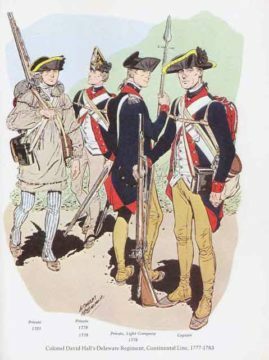 The regiment continued to perform well in the main army, initially serving in the Maryland Division and then, in 1778, in a Virginia division. It rejoined the Marylanders in 1779 and accompanied them south in the spring of 1780. It was shattered in the battle of Camden, with only enough men remaining to form two companies. Those companies stayed in action through Nathanael Greene's campaign, with the other officers returning home. New recruiting enabled two more companies to join General George Washington for the siege of Yorktown, and then went to Greene to relieve the two veteran companies. The last of the regiment went on furlough in early 1783, and formally disbanded on 15 November of that year. December 9 - Congress resolved that a battalion should be raised from the lower 3 counties of Pennsylvania. These counties are what is now Delaware. Delaware was not yet a completely separate state and was still part of the colony of Pennsylvania. The battalion, sometimes called a regiment, was made up of 8 companies. January 21 - The list of officers was completed. John Haslet was appointed Col. and Gunning Bedford Lt. Col.
February 27 - The Delaware battalion was assigned to the Middle Department (covering the mid-Atlantic states). April 12 - The unit was at nearly full strength. Six companies were stationed in Dover and two in Lewes. Arms were in short supply. Haslet noted that Capt. Caldwell was in Lewes with 150 men "completed for the field" but had very few guns in Dover. May - The uniforms were described as the best in the army, with blue coats faced and lined with red, buckskin breeches, white woolen stockings, and black spatterdashes (gaiters). The buttons were cast with "D.B." (Delaware Battalion) -- raw pewter for the privates, gilded for the officers. The round, black-jacked leather hats had a high front peak on which was written in gilt "Liberty and Independence. Delaware Regiment" It also bore the Delaware crest such as appeared on the Delaware paper money of 1776. June 3 - Congress resolved to establish a "flying camp" to defend New Jersey. It was made up of 10,000 militiamen from Pennsylvania, Delaware (apparently they anticipated the separation from Pennsylvania), and Maryland to be led by Brig. Gen. Hugh Mercer of New Jersey. THe term of enlistment was 5 months. Delaware's flying camp was led by Col. Samuel Patterson, a miller from Christiana Bridge. June 15 - The Assembly of the Lower Counties (of Pennsylvania) voted to separate itself from England and also from the rest of Pennsylvania to become the state of Delaware. This was 3 weeks before the Declaration of Independence was issued by the Continental Congress. July 12 - American troops in and around New York City watched as 150 ships arrived from England to supplement the 130 ships that had arrived several days previously from Halifax. August 5 - The Delaware Battalion arrived in Philadelphia with about 200 guns that had been borrowed from the Kent County militia. By August 8, the men were was fully armed with English muskets and bayonets. August 6 - The Delaware Battalion was assigned to the Main Army to join the "Flying Camp" under Brig. Gen. Hugh Mercer. On August 8 they received orders to proceed to Amboy, New Jersey. August 25 - Haslet's Delaware Battalion was assigned to Stirling's Brigade (Main Army, under William Alexander -- who claimed the title of Lord Stirling) and moved to New York City. August 26 - In the Battle of Long Island, Haslet's Delaware Battalion was on the line next to the Maryland Regiment. A strong British attack put Delaware and Maryland troops in the crossfire of two British units. Those who escaped fled under grapeshot and heavy musket fire through the Gowanus Swamp, which required crossing a deep creek. Some 300 of the 400 men from Maryland died, along with 31 of the 750 Delawareans. September 1 - The Delaware Battalion was assigned to Mifflin's Brigade (under Gen. Thomas Mifflin of PA). October 8 - Mifflin's Brigade was redesignated as Stirling's Brigade. October 9 - Patterson's Flying Camp Battalion of militia, about 480 strong, arrived in Amboy, New Jersey. The only battle in which the unit participated was an attack October 14 on a British fort at the east end of Staten Island. This led to skirmish in which one Delawarean died. October 28 - In Battle of White Plains NY Haslet's Delaware Battalion fought well. November 29 - Both of the Delaware units were both in Brunswick, New Jersey briefly. Patterson's Flying Camp battalion of militia had no tents and their enlistments were to be completed in two days. The men resisted entreaties to remain in Brunswick to resist the British advance through New Jersey and instead returned home before the British forces appeared. That was the end of the Flying Camp. December 2-7 - Haslet's Regiment remained with Washington and was the rear guard unit during the retreat from Princeton to Trenton. Washington's 2,200 exhausted men crossed the Delaware River, just 3 miles ahead of 20,000 British troops. December 12 - The captains returned to Delaware to recruit, while Col. Haslet and the remaining Delaware troops stayed with Washington. By December 22, there were only 100 men on the rolls of the Delaware regiment. December 25 - Haslet's Delaware Regiment was among the last units to cross the Delaware River for the surprise attack on the Hessian camp at Trenton, New Jersey. The Delawareans were at the center of the American line (under Stirling), and after several volleys from American cannon they charged down King and Queen Streets, overwhelming all opposition. This victory renewed hope for the cause of independence. Cadwalader's Brigade (with the Dover Light infantry) had crossed the river with the goal of providing a supporting attack, but withdrew when they couldn't get their two cannon across. December 27-January 2, 1777- Cadwalader's Brigade (with the Dover Light infantry) crossed the Delaware River into New Jersey and were later joined there by Washington's main force (with Haslet's troops). January 1 - The Delaware Battalion was renamed the Delaware Continentals and re-organized into eight companies. This was on paper only, since the unit was then in the field and had no captains and very few men left. January 3 - There were only a half-dozen men in the Delaware Regiment at the Battle of Princeton, New Jersey. Washington's surprise night-time withdrawal and move around Cornwallis' flank was undone by the unexected appearance of several British regiments coming to reinforce Cornwallis. In the sharp battle that followed Brig. Gen. Hugh Mercer of New Jersey was killed. Soon after that Delaware's Col. John Haslet was shot through the head and died instantly. Cadwalader's Brigade helped stem the British attack and later drove them from the field. In all, 23 Americans died at Princeton. January 6 - Rodney's Light Infantry were asked to be Washington's guard during winter camp at Morristown, New Jersey, but their enlistments were up and on January 14, they left for home. March - Lt. Col. David Hall was promoted to Colonel to lead the Delaware Regiment. Some 312 soldiers of the new Delaware Regiment marched into camp at Morristown. May 11 - Samuel Patterson was now a colonel of the New Castle County militia regiment, encamped at Naamans Creek. By July, he and two other colonels, Thomas Duff and Richard Cantwell, had raised 1,075 men for duty, although ammunition was in scarce supply, with only about four rounds per man. May 22 - The Delaware Regiment assigned to 1st Maryland Brigade (Main Continental Army) under Brig. Gen. William Smallwood. After an attack to ravage Staten Island they marched south to oppose the British invasion of Delaware. August 25 - British troops landed at Elkton Maryland, and marched into Delaware. They camped near Newark, Delaware. September 3 - British and U.S. troops skimished in the vicinity of Cooch's Bridge (over Christiana Creek) north of Glasgow, Delaware. September 11 - At the Battle of Brandywine (near the Delaware- Pennsylvania border) the Delaware Continentals were with General Stirling's reserve units at the rear when a surprise flanking attack by the British threw them into the thick of battle. They fought well and managed an orderly retreat under fire. October 4 - At the Battle of Germantown, the Delaware Regiment's attack went well at first, but then they ran short of ammunition and scattered when their deep advance on a narrow front left them surrounded by the enemy. The Delaware Regiment suffered heavy losses. Col. Hall was severely wounded and did not fight again. 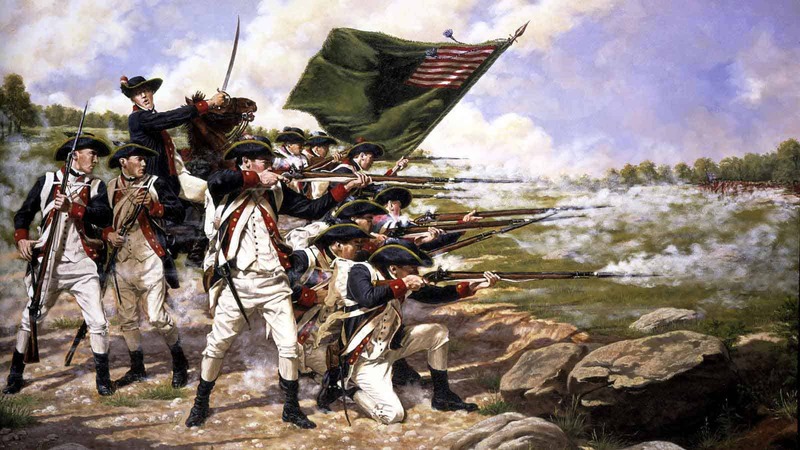 Jun 28 - The Delaware Regiment participated in the Battle of Monmouth, New Jersey. Jul 22 - The Delaware Regiment was assigned to 3rd Virginia Brigade (Main Continental Army). Capt. Allen McLane's company was assigned to the 2nd Partisan Corps from Deember 16, 1778- January 13, 1779. Capt. Allen McLane's Company assigned on December 16, 1778 from Patton's Additional Continental Regiment. May 12 - The Delaware Regiment was re-organized into nine companies and assigned to the 2nd Maryland Brigade (Main Continental Army) under Col. William Gist and Maj. Gen. Johann de Kalb. July 13 - Withdrawn from the Delaware Regiment and assigned to Lee's Corps of Partisan Light Dragoons as the 4th (Dismounted) Troop. April 5 - The 2nd Maryland Brigade was assigned to the Southern Army. The Delaware Regiment marched south led by Lt. Col. Vaughan, with only about 300 men. August 16 - At the Battle of Camden, the Delaware Regiment suffered heavy losses. All officers above captain were captured and 48 men died. Maj. Gen de Kalb also died. After this time the unit had no colonel and ceased to function as a regiment. September 3 - The Delaware Regiment was re-organized into two companies under captains Robert Kirkwood and Peter Jaquett. January 1 - The two Delaware companies were assigned to the Maryland Brigade (Southern Army). January 17 - The two Delaware companies participated in the Battle of Cowpens. March 15 - The two Delaware companies participated in the Battle of Guilford Courthouse. April 25 - The two Delaware companies participated in the Battle of Hobkirk's Hill (in Camden, South Carolina). Summer - Two additional Delaware companies were formed at Christiana Bridge, Delaware. September 8 - The two Delaware companies in the south participated in the Battle of Eutaw Springs. January 4 - The four Delaware companies were re-organized into two companies. January 17 - The four Delaware companies were furloughed at Christiana Bridge, Delaware. November 15 - The four Delaware companies were disbanded. The regiment would see action during the New York and New Jersey Campaign (1776-77), Northern Theater (1778–1782), Philadelphia Campaign 1777-78, Defense of the Carolinas, Greene's Campaign. Delaware Final Payment Vouchers Index for Military Pensions, 1818-1864 These slips serve as an index to final and last payments to over 65,000 veterans of the Revolutionary War and some later wars. Revolutionary War Pensions Revolutionary War Pension and Bounty-Land Warrant Application Files. Delaware Revolutionary War Prize Cases - Captured Vessels Prize cases heard on appeal from Colonial and state courts by the Continental Congress and the Court of Appeals in Cases of Capture. Delaware Revolutionary War Rolls, 1775-1783 Muster rolls, payrolls, strength returns, and other miscellaneous personnel, pay, and supply records of American Army units, 1775-83. Delaware Revolutionary War Service Records Compiled service records of soldiers who served in the American Army during the Revolutionary War, 1775-1783.